Dust of your platforms and dig out your flares as the world’s number one touring ABBA production ABBA MANIA, returns to St George’s Hall in Bradford on Saturday 21 February. Celebrate 40 years since the Swedish Supergroup scored their second UK number 1 with Mamma Mia in this special concert presentation that will revive special memories of a bygone age when ABBA ruled the airwaves. Following their Eurovision success with Waterloo in 1974, Agnetha, Bjorn, Benny and Anni-Frid, aka ABBA, dominated the charts for nearly ten years, enjoying nine UK number 1 hits and becoming Sweden’s highest paid exports. 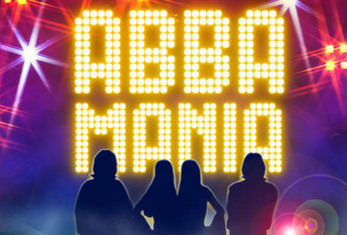 Their timeless songs were written to be enjoyed live and ABBA MANIA gives you exactly that. Two hours of uplifting, dance inducing and sometimes heart-breaking songs, fully live with fantastic staging, lighting and effects. The show recreates ABBA’s sound not only perfectly, but respectfully too. ABBA MANIA is not only for life long, die hard ABBA fans but the new generation of fans, who never had the opportunity to see ABBA live. Hits include ‘Dancing Queen’, ‘Waterloo’, ‘Mamma Mia’, ‘The Winner Takes it All’, ‘Super Trouper’, ‘Fernando’, ‘Take A Chance On Me’ and many more that continue to fill dance floors worldwide.